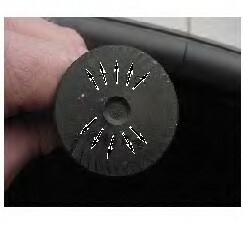 Valves may not display oil degradation, adhesive wear, or fretting if valve lash was too tight. 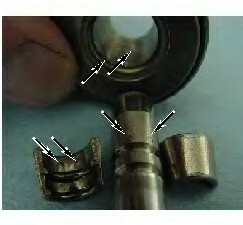 Also if valve lash was too tight valve heads may show repeated contact with the piston. 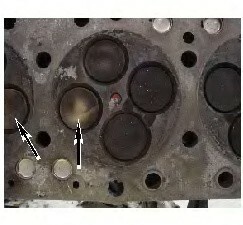 Tight lash may affect only one valve in a cylinder or all the valves within the engine. If the valve lash is too tight, compression and combustion gases may leak past the valve face and the valve seat. 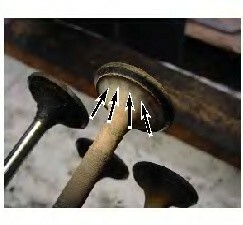 This will cause the visual signs of gas to be left behind on the valves’ face and valves’ fillet. The gas leaks may overheat the valve head and the valve stem which will cause the material of the valve to weaken. Carbon buildup or thick oxide coatings on the valve face or the sealing area of the seat can crack causing gases to leak past the valve face. When the coating cracks, the hot gases have a path to escape.